1 1 On May 1, 1789, the Rev. William Linn (Presbyterian minister shown below) was elected as Chaplain of the U.S. House of Representatives meeting in New York CIty, continuing the tradition established by the Continental Congresses of each day's proceedings opening with a prayer by a chaplain. Early chaplains alternated duties with the Senate chaplains on a weekly basis. The two ministers conducted Sunday services in the House Chamber every other week. Rev. Linn had served as a chaplain to the Continental Army during the America Revolution and then later as a trustee and President at Queens College (now Rutgers University). 2 1559 On May 2, 1559, John Knox returns to Scotland after spending several years on the Continent studying and writing. returns to Scotland to help lead the Reformation there. The next year he would lead five others in writing the Scottish Confession of Faith (1560). 2 1759 On May 2, 1759, the charter was recorded for the Corporation for Relief of Poor and Distressed Widows and Children of Presbyterian Ministers  America's first life insurance company. Known as the Presbyterian Ministers Fund for Life Insurance, this non-profit mutual fund was formed by Presbyterians for their ministers. 3 1738 On May 3, 1738, English preacher George Whitefield arrived in America for the first of eventually 7 visits. It is his preaching that ignites the Great Awakening in the colonies and splits Presbyterians and ministers in the New Side and Old Side. 5 1816 On May 5, 1816, the American Bible Society was formed in New York City. One of the founders, Presbyterian Elias Boudinot became the society's first president in 1816. During 1817, the society distributed its first Bibles to the crew of the USS John Adams, as well as to the Steuben County Bible Society. Boudinot was former President of the Continental Congress and later a U.S. Congressman. 6 1746 On May 6, 1746, Presbyterian minister William Tennent died in Neshaminy, Pennsylvania. Rev. Tennent (1673 - 1746) joined the Presbyterian denomination in 1718 and in 1726 served as pastor in Neshaminy. He started a school for training ministers, operating first out of his home and then in a 20-foot by nearly 20-foot "Log Cabin" academy. This "Log Cabin College" operated from about 1727 to 1745. Many of the leaders of the Presbyterian "New Side" were trained here. 7 2008 On May 7, 2008, the Rev. 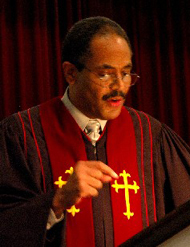 Dr. Brian Blount was inaugurated as President of Union Theological Seminary in Richmond, Virginia. Reverend Blount (shown at right) is the first African-American to head the seminary which was founded in 1812. 8 1984 On May 8, 1984, Rev. Benjamin Weir (shown at left), a Presbyterian clergyman and missionary, was kidnapped in Beirut by members of a Palestine terrorist organization. He was released on September 14, 1985, and in 1986 was elected moderator of the 198th General Assembly of the Presbyterian Church in the United States of America. On May 9, 1930, the New York Times ran an article: "Whether women shall be allowed to fill the pulpits of Presbyterian churches or to act as elders will be one of the important questions considered at the 132d annual meeting of the General Assembly of the Presbyterian Church, beginning here May 20." Lillian Herrick Chapman (right) had been licensed to preach in 1917 in the Presbyterian Church (USA), but the Synod of New York had overturned her licensing in 1919. A successful vote by the PC(USA) to allow women as elders would wait an additional decade with Sarah E. Dickson (right) becoming the first woman elder on June 6, 1930. 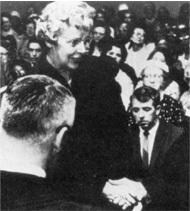 The first women ordained woman minister in the Presbyterian Church (USA) would be Margaret E. Towner (below) in 1956. 10 1774 On May 10, 1774, the first Presbytery in the American colonies by the Reformed Presbyterian Church was formed in Pennsylvania. The first Reformed Presbyterian minister had come to the America in November 1752 just nine years after the formation of the Reformed Presbyterian Church of Scotland (1743). The Reformed church would merge with the Associate Presbyterian Church in America on November 1, 1782, to create the Associate Reformed Presbyterian Church. With later mergers in 1858, the group became known as the United Presbyterian Church of North America. 11 1824 On May 11, 1824, the new Presbytery of the District of Columbia first met in Alexandria, Virginia. Previously part of the Presbytery of Baltimore, the new presbytery had church membership of 277 and the first moderator was the Rev. John Brackenridge, who at that time was Chaplain of the U.S. House of Representatives. The first Presbyterian minister in Washington, D.C., Reverend Brackenridge served twice as the minister of St. Andrew's (1795 - 1797) and later the First Presbyterian Church (1811 - 1817) of Washington, D.C. He also served as pastor to the Bladensburg (MD) Presbyterian Church for more than 40 years and supervised the creation of the Rockville Academy. 12 1965 By 1964, the Presbyterian Church in the United States allowed women to be ordained as ministers. On May 12, 1965, Hanover Presbytery ordained the Rev. 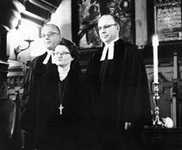 Rachel Henderlite (right) at All Souls Presbyterian Church in Richmond, Virginia, as the first woman minister in the PC (US). 13 1878 On May 13, 1878, Smithsonian Institution Secretary Joseph Henry died in Washington, D.C. A lifelong Presbyterian, Henry was an outstanding scientist who served as the first Secretary of the Institution from 1846 to his death in 1878. His funeral was on May 16th at the New York Avenue Presbyterian Church. 14 1874 On May 14, 1874, Black members of the Cumberland Presbyterian Church met at Murfreesboro, Tennessee, to organize what was called the Second Cumberland Presbyterian Church. The predominantly African-American denomination later became known as the Cumberland Presbyterian Church in America. 15 1902 On May 15, 1902, the cornerstone was laid for the Texas Presbyterian College for Girls, founded by the Texas Presbyterian Synod. The school opened for its first class on September 24, 1902, in Milford, Texas, with 33 boarding students, 22 day students, and nine faculty members. The school adopted the motto "Christian Women for Christian Homes." It originally offered primary and secondary education, but by 1911 it operated a high school academy separate from the college. 18 1834 On May 18, 1834, Sheldon Jackson, Presbyterian missionary to the frontier West and Alaska, is born in Minaville, New York. Jackson's reputation for ministering to the spiritual, physical, and social needs of both natives and settlers earned him the nicknames "Bishop of All Beyond" and "Apostle to Alaska." Photo courtesy of the Sheldon Jackson Museum, Sitka, Alaska. at the then brand-new Grauman's Chinese Theatre (which joined Sid Grauman's existing Egyptian Theatre). Thousands of people lined Hollywood Boulevard opening night (see left ) and a near riot broke out as fans pushed to catch a glimpse of movie stars and other celebrities at the premiere. Ever the showman, DeMille enlisted four local clergymen to open the festivities. Representing Protestants was Presbyterian Rev. Dr. Robert Freeman, pastor of the Pasadena Presbyterian Church. The movie ran for months on a twice-a-day reserved seat policy. 21 1789 On May 21, 1789, the first General Assembly of the Presbyterian Church in the United States of America met in Philadelphia. The Rev. Dr. John Rodgers of the Brick Church in New York City was elected moderator. 24 1854 On May 24, 1854, Presbyterians founded the first black college in the United States  Ashmun Institute in Pennsylvania. Renamed Lincoln University in 1866, the school was founded by the Rev. Dr. John Miller Dickey, and his wife, Sarah Emlen Cresson. 25 1824 On May 25, 1824, the non-denominational American Sunday School Union (ASSU) was formed to promote such schools and to produce materials. The ASSU model is based on the 1816 adult Sunday School union created by Presbyterian Alexander Henry in Philadelphia. 26 1858 On May 26, 1858, The United Presbyterian Church of North America was formed by the merger of the Associate and the Associate Reformed Presbyterian churches in Pittsburgh, Pennsylvania. 27 1745 On May 27, 1745, the Synod of Philadelphia (Old Side) recognized the separate Synod of New York (New Side), formed by the Presbytery of New York and the Presbytery of New Brunswick. This was part of the first temporary schism (1741 - 1758) in the Presbyterian church. 31 1803 On May 31, 1803, the Presbyterian General Assembly approved the Rev. Gideon Blackburn's proposal to establish a school for Cherokee children and gave him $200 for living expenses. He obtained an additional $730 from private donors and the United States government, following a meeting with President Thomas Jefferson. In Fall 1803, Cherokee leaders granted him permission to begin his work. He operated his schools for the Cherokees until 1810. Blackburn also is known for the churches he established in Tennessee and Kentucky. He went on to serve briefly as president of Centre College. © 2014. Presbyterian Heritage Center at Montreat.